In 1986, President Ronald Reagan was well into his second term, Halley's Comet soared near Earth, and the Gold Eagle series was first minted by the U.S. Mint, with a single denomination of $50 for Proof coins. The mintage of Proof coins was comparatively small - only 446,290 - while all four sizes were struck in mint state coins in much larger numbers. The price of Gold in 1986 was low as well, closing at only $390.9 an ounce. Gold has increased in value dramatically in the past thirty years - as has the value of this coin. Now, you can add this First Year Proof to your collection through GovMint.com. American Gold Eagles are one of the world's most popular coins, and producing a Proof coin requires a specialized minting process that involves uniquely prepared dies and planchets. These planchets are struck multiple times to bring up the full details of the design in cameo appearance. And what gorgeous details they are! The obverse of the 1986 Gold Eagle features a modified rendition of Augustus Saint-Gaudens' Lady Liberty design. Liberty is striding forward with long, flowing hair, and she carries a torch in her right hand and an olive branch in her left. A brilliant sun rises behind her and the coin is encircled with stars. The Saint-Gaudens design had been used on U.S. $20 Gold pieces from 1907-1933, and is one of the most popular coin designs ever minted in U.S. History. Also inscribed on the obverse is "LIBERTY," and the date represented with the Roman Numeral "MCMLXXXVI." 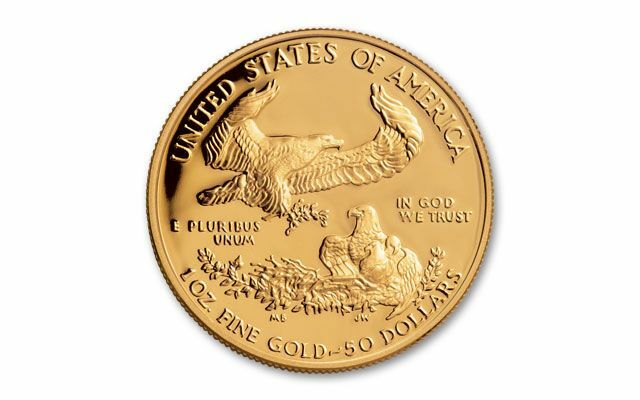 The reverse of your $50 American Gold Eagle Proof was designed by sculptor Miley Busiek and features a family of eagles. One eagle carries an olive branch above a nest where another eagle and a hatchling are perched. Inscribed on the reverse is "UNITED STATES OF AMERICA," "IN GOD WE TRUST," "E PLURIBUS UNUM," AND "1 OZ. FINE GOLD-50 DOLLARS." This stunning coin was minted at the West Point Mint, which has served as the only mint to produce Gold Eagle Proof. Struck in .9167 Gold, this coin is a rare find due to its low mintage, first-year status and exceptional condition. 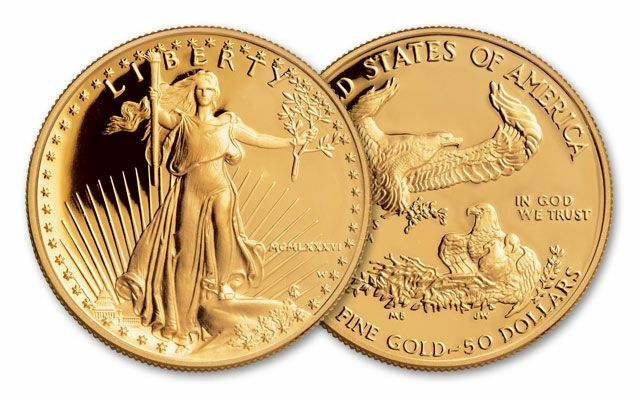 Even if you are a dedicated silver collector, the beauty and significance of the 1986 $50 Gold Eagle Proof is worth a place of honor in your collection! 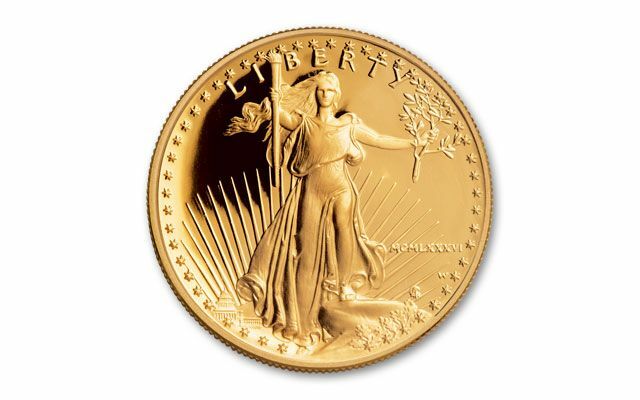 Contact GovMint.com today to get your Gold Eagle!